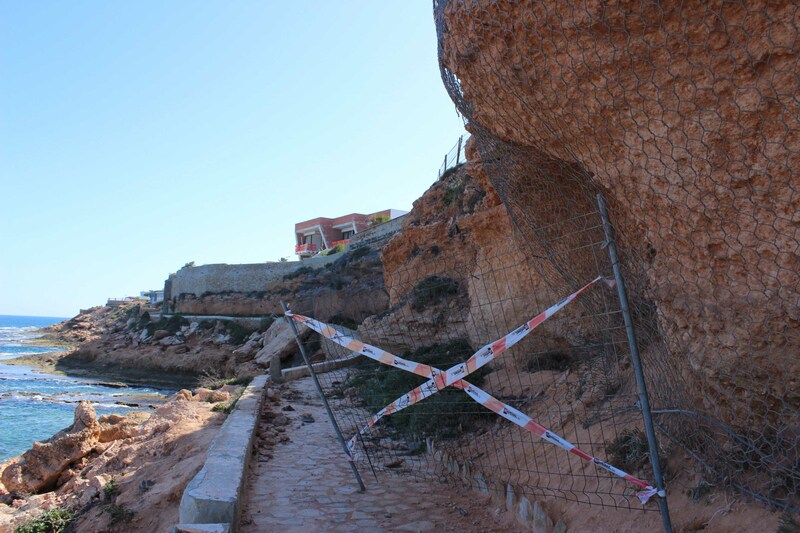 The City of Orihuela has once again said that the owners of houses built on overhangs and cliffs directly above the Orihuela Costa coastal path will have to pay for the work necessary to prevent landslides onto the promenade that runs from Punta Prima to Mil Palmeras. The news follows further rock falls that have occurred in recent weeks after which municipal officials have once again met with the Provincial Directorate of Coasts to request advice on how they can prevent the continuing fall of rocks and stones that pose a danger to the general public. 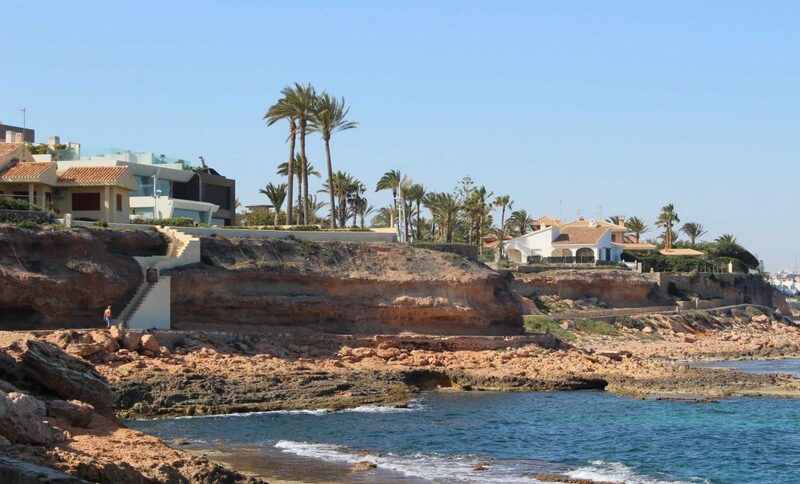 Surveyors have once again been forced to close stretches of the walkway between Cabo Roig and Cala Bosque, La Zenia. Originally they were marked only with warning signs but in recent days some of the sections have been shut off with metal barriers, warning of the dangers. The City Council has now said that it will require the owners of some coastal properties to pay for a project that avoids further landslides and possibly reroutes some of the pathway. A spokesman said that staff are currently preparing letters that will be sent to the affected owners. Following the landslides that have been happening for many years there are currently dozens of single-family houses where part of the garden area is, literally, up in the air. The land on these slopes is unstable and there is a serious danger that many of the constructions could collapse. In a recent meeting held by the councillor of Beaches, Luisa Boné (Cs), and of Urban Planning, Rafael Almagro (PP), with the Provincial Coastal Service, the agency made it clear that it would not authorise repairs to the overhanging land with landfills or pillars. However, this is what the City Council is now going to force the owners to do. They will be required to pay for a project that will need, first, to be approved by the Costas. Once they have the approval they will then be required to obtain the corresponding work permits from the Town Planning Department. If the work is not carried out within a reasonable period of time, which has yet to be specified, the City Council will undertake the work itself, the costs of which will be passed on to the owners of the houses. Many of these houses were built years ago when urban planning was non-existent with the owners now saying that they are very concerned about the possibility of new landslides, since parts of their land have been eroded and previous landslips have caused the walls and fences on their land to break or fall over. The councillor for the coast, Luisa Boné, says that the City Council has already undertaken works including a stone breakwater in Agua Marina and reinforcement work on the cliffs at Cabo Roig in May 2017. The latter consisted of fastening mesh to the cliffs to avoid uncontrolled landslides due to erosion of the rock. But the mesh simply does not work because of the speed at which, in some places, the erosion is now taking place. The Neighbourhood Association FAOC, meanwhile, is cautious of the council’s intentions with spokesman Tomás Moreno saying that it looks to be nothing more than a smoke screen.